In his book on Cambridge Nikolaus Pevsner describes Magdalene Street as having ‘the best group of pre-classical domestic architecture in Cambridge’. Most of the present buildings originate from the 16th Century, although they have all had subsequent additions and alterations. The buildings were merchant’s houses or Inns. Given Magdalene Street’s proximity to the buzzing Port of Cambridge this was once a thriving commercial centre-playing host to many European traders. In the early nineteenth century it was reported that there were 31 Inns and beer establishments between Bridge Street, Quayside and Magdalene Street. Magdalene Street boasted 5 inns. The Cross Keys Inn, Pickeral – dating back to 1540, The Swans, Plough Arms and The King’s Head. The Yards attached to these Inns were where the beer was brewed. 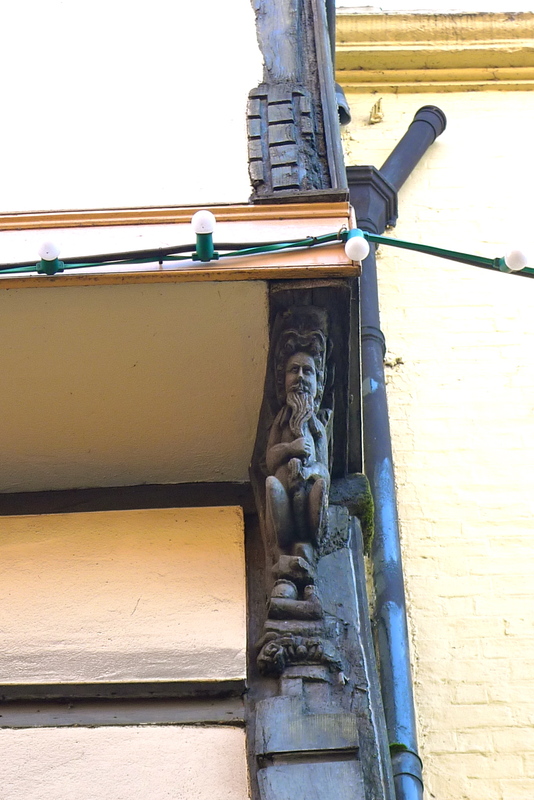 Whilst today only the Pickerel Inn survives there remains some tell tail signs of spirits from the past. 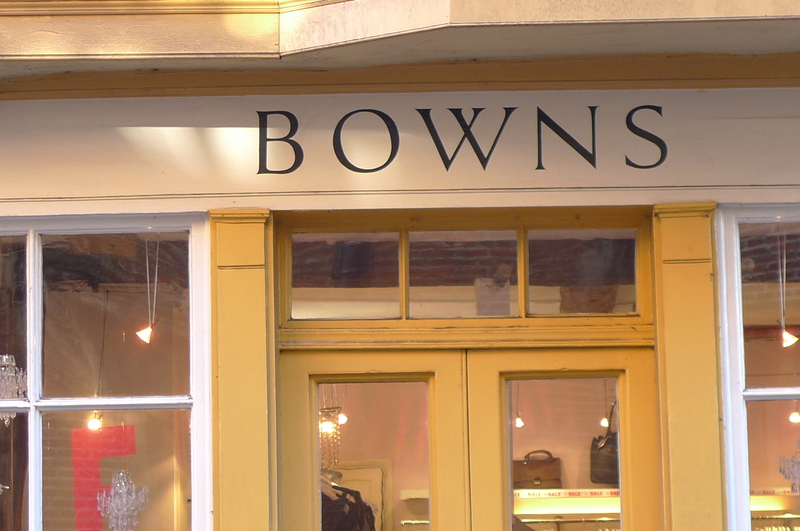 Today at 25 Magdalene Street we find a very respectable and classy ladies clothing shop. Selling adorable and quirky designs from Paul Smith and Vivienne Westwood (to name a few). But if you can manage to drag your eyes away from the tempting baubles in the shop window and cast your eyes upwards you will be in for a surprise. 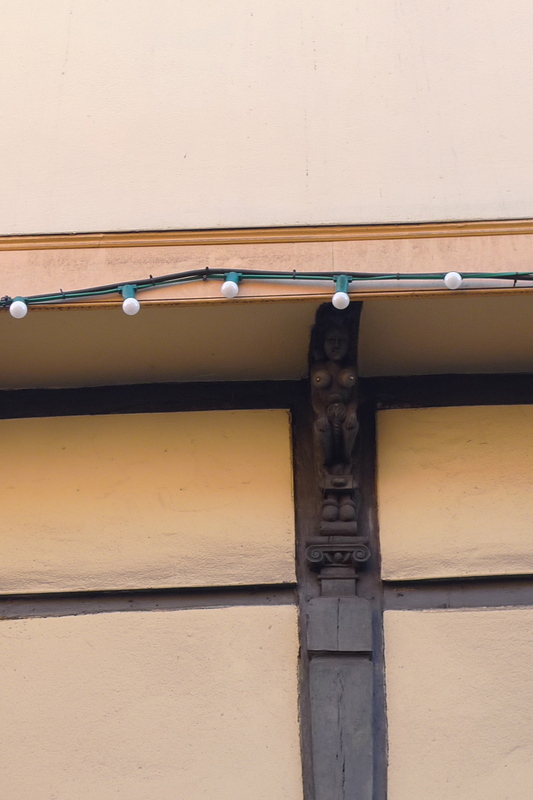 Carved ‘grotesques’ or brackets support each of the overhanging floors. These carvings leave little to the imagination. Local lore will tell you it was a brothel and was used by Samuel Pepys – a student from across the road. Students and ladies of the night seemed to go hand in hand at one time in Cambridge. However, it is more likely that the figures were a protection against witchcraft – a wandering witch would take fright – as well she might! This entry was posted on Tuesday, January 24th, 2012 at 8:40 am	and posted in Uncategorized. You can follow any responses to this entry through the RSS 2.0 feed. 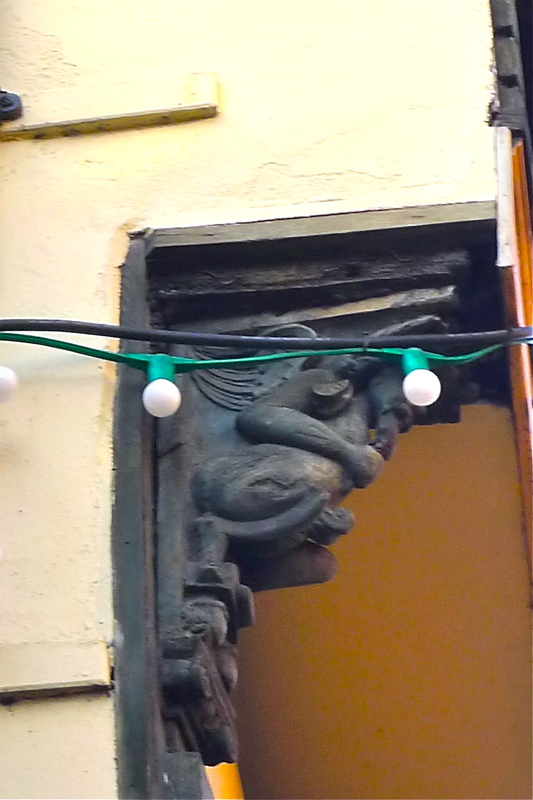 I absolutely love grotesques. They are not the same as gargoyles are they? Anyway I have either a grotesque or a gargolye one sitting on my desk and another on my bookshelf.